TAMPA BAY – Stuart Sternberg, owner of the Tampa Bay Rays, stood in Tampa today (Feb. 9) to confirm what many had long suspected – the team is focusing on Ybor City as its future home. 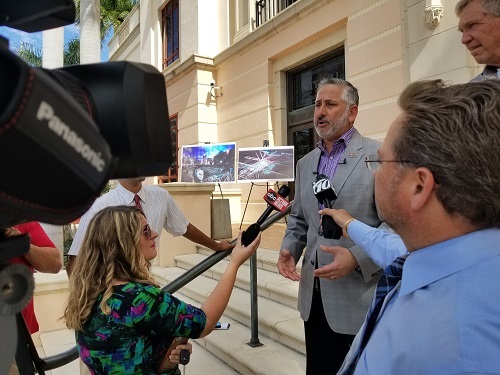 A half an hour earlier, Mayor Rick Kriseman stood on the steps of St. Petersburg City Hall and reminded residents that the move is not a done deal. But, Kriseman said, the city is moving forward with its next phase in creating a master plan to redevelop the 86-acre Tropicana Field site without a baseball stadium. Among possible stumbling blocks to a deal is the financing – money was not discussed during Sternberg’s announcement. Other hurdles that must be crossed include ingress and egress from the Ybor City property to roads and other transport in Tampa Bay, and the way the stadium might fit on the site, which is two acres smaller than the 16-acre site set aside for the stadium on the 86-acre St. Pete property. The Ybor City site, Kriseman said, that do not exist on the St. Pete site. If the Rays do decide to move, he said, it would not happen immediately because the team would remain while a new stadium is built. That means, the team would stay in St. Pete for a another three or four years, taking a final move closer to the 2028 termination date of their agreement with the city. In case, the team does decide to move, Kriseman said, the city is getting ready for it. Officials have already created a master plan for the Tropicana Field site that includes a stadium. With not stadium, an additional 16 acres is in play for other redevelopment that could include hotels, university or hospital research sites, offices, or other development. As it is, the mayor said, the redevelopment is already sparking national interest. “This site is being called a once-in-a-lifetime opportunity that doesn’t exist anywhere else in this country,” Kriseman said. That’s in part because of the size of the property but also because of its location within a city and within blocks of a waterfront, a vibrant downtown, and museums and other cultural attractions. “There are a whole lot of developers who are excited about this property,” Kriseman said. Kriseman conceded there would be losses if the Rays do move. The most obvious, he said, are the jobs. That’s why one of the goals of the redevelopment is to create more jobs that are year-round, not just during 80 home games. “We’ve got an incredible opportunity for this parcel to be a significant job creator,” Kriseman said. It will be harder to replace the emotional attachment the city has for the team. And, Kriseman said, if the team moves, he hopes team members and the foundation will remain active in the community. Photos show St. Petersburg Mayor Rick Kriseman discussing the news that the Tampa Bay Rays are focusing on Ybor City as a future home. Courtesy of the city of St. Petersburg. The owner of the Tampa Bay Rays says the team is focusing on Ybor City as its future home. St. Petersburg Mayor says a final decision to move the team is "long, long away."